No longer available, but you can get the comic as a PDF here! The Banal Pig Fan Club Membership Pack is a multimedia extravanganza of all things Banal Pig. 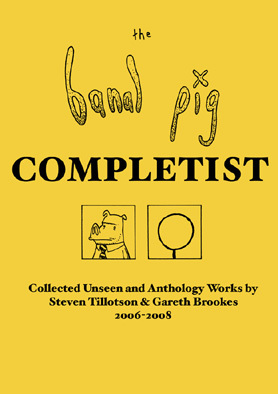 It contains a certificate, a full-colour A3 poster, a badge (from a selection of around 10) and a 20 page comic, The Banal Pig Completist, bringing together unseen strips by Steven Tillotson and Gareth Brookes. It doesn’t end there though, it also contains a 3-track ep by Gareth Brookes with songs about Strong Baby, Retard Dad and Jolly Bear. Pingback: the banal pig » Buy the Anthology! Im on covered! Pingback: the banal pig » WINNER!